Unemployed ex-party girl Angela Cray is back living with her no-nonsense mother in Phoenix. After coming within air-kissing distance of a felony charge, Angela is determined to make something of her life. When a sympathetic neighbor offers her work, Angela jumps at the opportunity. She figures it won’t be hard to track down a missing fiancé last seen with two Lady Gaga lookalikes. After all, one of her superpowers is finding badly behaved men. But the trail of the runaway groom has more twists than a bride’s updo. And when Angela uncovers secrets that people will kill to keep hidden, she has to decide the price she’s willing to pay for success. Angela will need to call upon all her charm and cunning—and the deities of her ancient Samoan ancestors—to make sure this professional growth opportunity doesn’t kill her first. 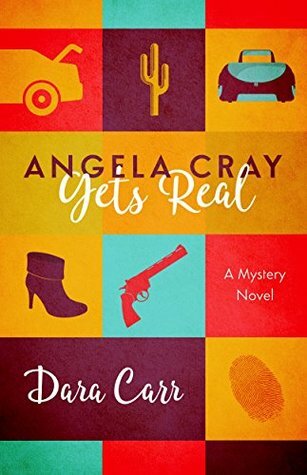 Angela Cray Gets Real was a finalist for a Freddie Award for Writing Excellence from the Florida Chapter of the Mystery Writers of America. Hello everyone! I’m very pleased to have Dara Carr as a guest on The Book’s the Thing today. Read her post below, and be sure to check out her book (links below) and visit her at www.daracarr.com. At times, my parents must have wondered how I could be related to them. My mechanical engineer father probably marveled at the perverse genetic roll of the dice that gave him a daughter stymied by the assembly of an Ikea dresser. My tough-as-nails mother, who’d played hockey for the University of Saskatchewan, must have been gobsmacked when I won the “cowardly lion” award for being the most skittish member of the high school badminton team. And so it goes with the protagonist in my novel, ANGELA CRAY GETS REAL. Angela is a fashionista and spa devotee with a checkered past and a wild streak. Given my slovenly ways and strong responsible streak, I can’t help but ask: Where on earth did this character come from? The answer is at once obvious (me, of course!) and not so straightforward. As a writer, I don’t have control over which character will spring to life on the page. When I began planning the novel, the star of the story was going to be Monalisa Walker, Angela’s brilliant and eccentric boss, a lawyer and forensic accountant. But Angela ended up taking flight, delighting and energizing me. While Angela is not flesh and blood, she’s nevertheless something more than the love child of my espresso and laptop. In her late twenties, Angela is unemployed and back living with her no-nonsense mom in Phoenix. When Monalisa offers her work, Angela leaps at the opportunity and doesn’t ask too many questions. She figures the gig—helping track down a runaway fiancé last seen with two Lady Gaga impersonators—will be a cinch. This being a mystery, Angela is, of course, dead wrong. Angela’s mom, a tough-as-nails emergency room nurse, isn’t impressed with her daughter’s new job opportunity. She tries to steer Angela in a more practical direction, toward a profession that offers a regular paycheck and health benefits. Angela, who is fastidious about appearances, tries to help her mother with pointers on fashion, grooming, and restorative spa treatments. Her mom proves immune to Angela’s counsel, betraying no interest whatsoever in improving her appearance. Oddly, I have proven less immune to Angela’s influence. I first noticed something off one morning this past summer. The day began as usual, with me in a frenzy getting ready for work. I was just about to put on a shirt when I was rudely interrupted by a voice in my head. Sure, why not. In case you didn’t notice, I’ve got a bus to catch. Looking at the shirt through Angela’s eyes, I could see that, indeed, it was quite wrinkled. I took a few minutes to iron it. Soon after that, at the hair salon, when asked if I wanted to schedule my next appointment in advance, I surprised myself by saying “yes.” I swear that Angela, who fervently believes that looking better makes you feel better, made me say that. Typically I let eons elapse between appointments then never fail to express astonishment at how different I look after a haircut. The next sign? In my possession, there used to be a beloved pair of boiled wool clogs. After ten years of use, the soles showed signs of cracking and disintegration. Anywhere I walked I’d leave bits of black rubber in my wake. My protagonist found that appalling. RIP, dear clogs, you served me well. Wherever Angela came from, she’s helped me become a more presentable-looking person. That said, I’m still my mother’s daughter. These days, my tough-as-nails mom is in that great hockey rink in the sky. Every so often, I hear her loud and clear, telling me to stop fussing with my hair already and get on with my next book. A native of Chicago, Dara Carr grew up wanting to be a professional figure skater and Glinda the Good Witch. Sadly, she didn’t succeed on either count. Luckily, she’s been able to pursue a life path where good knees and sorcery aren’t strictly necessary. She currently lives in the Washington, DC area. Her short fiction has appeared in Ellery Queen’s Mystery Magazine and Shotgun Honey. ANGELA CRAY GETS REAL was a finalist for a Freddie Award for Writing Excellence. You can find her and the occasional tumbleweed at www.daracarr.com. Interesting post. Thanks for the review. Haha, Dara. You never came across as “slovenly”. Quite the contrary. But why not have someone whisper advice in your ear, even if that someone is your own imagination.